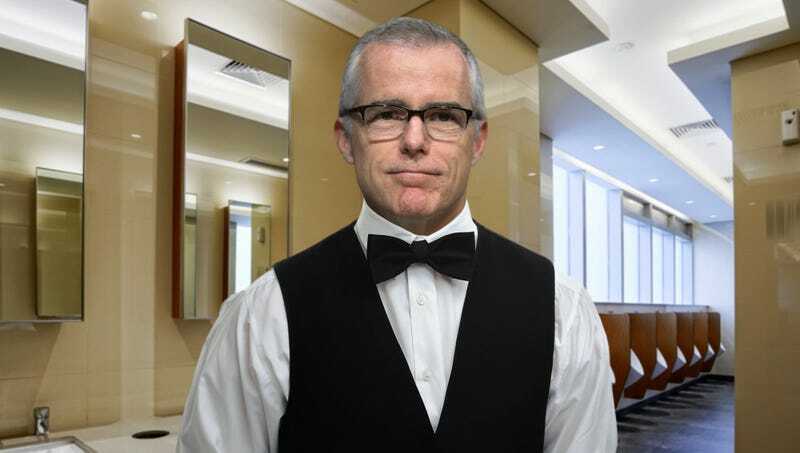 WASHINGTON—Wearing a double-breasted tuxedo vest and black bowtie while sitting next to the sinks in the U.S. Capitol men’s room, recently-fired FBI Deputy Director Andrew McCabe reportedly plans to spend the next three days as a congressional bathroom attendant to satisfy his pension requirements, sources confirmed Monday. “Senator Cruz, looking very sharp today, sir—Can I offer you anything? Hot towel? Breath mint?” said the former senior intelligence official, rising from a tall wooden stool, unfolding a white handkerchief, and displaying a rolling suitcase containing an array of colognes, mouthwash, and chewing gum before turning to greet a congressman hurrying into a nearby stall. “Let me get that hot water going for you, Mr. Burr. By the way, how’s the probe going? Ha-ha, very good, sir. And you have a very nice day.” At press time, McCabe had taken a break from scrubbing urinals in order to count up the nearly $4.50 in tips he had made over the course of the day.